The Diversity Center is located in the basement of Atherton Union. Photo by Regan Koster. 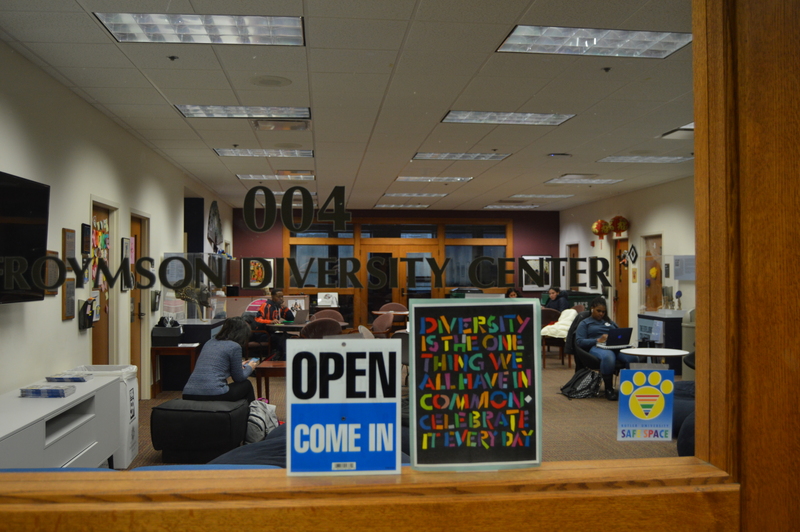 During the month of January, the Efroymson Diversity Center ran without a director after Valerie Davidson retired from Butler University at the end of fall semester. The interim director, Gina Forrest, started the position on Feb. 4. Before she started, student managers picked up extra responsibilities to keep the Diversity Center running. Davidson had served in her role as director of diversity programs and the Diversity Center since 2006, according to her LinkedIn page. She had been employed at Butler for 30 years. Student managers were in charge of ensuring that everything continued to run smoothly. In addition to their typical responsibilities, they took the time to address concerns that the clubs and organizations housed in the Diversity Center had about the lack of leadership. Li’Yonna McCallum, a senior journalism major, is a student manager at the Diversity Center. Mark Williams, a senior international studies and German major, is also a student manager at the Diversity Center. Williams and the other student managers had a meeting with SGA president Sam Varie to discuss the concerns of students students who frequently visited the space. Students wanted to know what the future of the Diversity Center was going to look like. At the time, Forrest was not yet named interim director. Forrest is currently working in the Diversity Center on a part-time basis and is scheduled to stay at Butler until the end of the semester if no one is found for the position before then. Before taking on her current role, Forrest served as an instructor in College of Pharmacy and Health Sciences and a diversity initiatives facilitator. Last school school year, she hosted a training workshop related to diversity and inclusion topics twice a month for COPHS faculty and staff. During her time as Diversity Center director, Davidson oversaw the Morton-Finney scholarship for selected students. Part of the requirements for the scholarship included monthly meetings with Davidson and service hours. Now that she is no longer at Butler, scholars currently report to Caroline Huck, the executive director of student involvement and leadership. Currently, the search for a new director has yet to fully begin, as the job description has not been finalized by HR to be posted on the Butler website. Forrest said she encourages students to visit the Diversity Center and talk about what changes they do or do not want to see. On Tuesday, Frank Ross, vice president for student affairs, emailed a survey for students to provide feedback relating to the future of the Diversity Center.